Coastal Foraging experiences is hosted by Craig Evans. Craig Evans has a life-long passion for sea life and it’s environment; and a keen interest in all aspects of our localities. 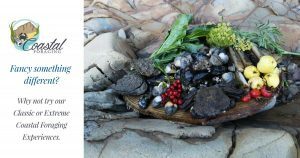 Coastal Foraging offer both enjoyable and informative foraging experiences, with the opportunity to cook some of the delights that are discovered on your day on a hand-made Solva Stove (a.k.a. Swedish Candle). Craig takes walks along the coasts of Carmarthenshire and Pembrokeshire and finds ingredients to cook up a feast right there and then – proving there are rich culinary pickings on the beach, from mussels to plants and crabs. Following my 12 years as an RAF aircraft engineer, 17 years working for a major high street bank and having very recently sold my woodland after 8 years of management, I am now embarking on a career to share my knowledge and passion with the wider world. If you like to see more of what Coastal Foraging do, please CLICK HERE to view their YouTube channel. Don’t forget to like and subscribe!